At International Granite and Stone, we offer basic kitchen remodeling construction services under our Florida General Contractor’s License. International Granite and Stone carries a General Contractor’s License, to ensure your project gets done correctly and efficiently with professional expertise. These services include High Bar Cutdown, Electrical Outlet Relocation, and Dry Wall Repair. Does your Countertop Island have a raised Bar Top attached to your Countertops? 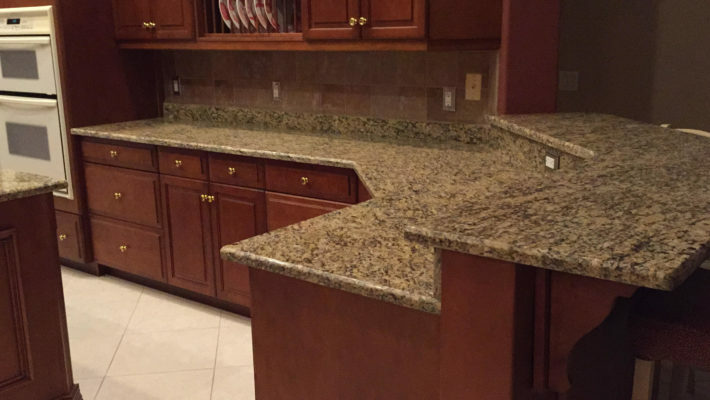 A style present in some homes, some Countertops have a High Bar Area attached to the Kitchen Countertops. If desired, the area can be cut down and leveled with the rest of the Countertop Area. Another service we offer is relocating your existing electrical outlets. Sometime when a high bar counter is cut down, Electrical Outlets need to be moved around for the best fit. We can cut out a new outlet space for your new countertops, and rewire the outlet. We also offer dry wall repair services, to cover old electrical outlets, or any slight holes or imperfections in your drywall.